Do you have a collection of old pictures or slides tucked away in boxes and stacked in the back corner of your closet? Then your cherished memories are vulnerable not just to fading and scratches, but are at risk of becoming completely forgotten! Today, with digital picture technology, electronic albums and digital photo frames commonly available at affordable prices, there is no reason why anybody should take that risk. Although digital photography has been with us for over 20 years now, many people still have old pictures or slides sitting in old shoe boxes in hard-to-reach places that make the memorable moments hard to enjoy. They may have rolls of developed film or slides in kitchen drawers waiting for the better days. 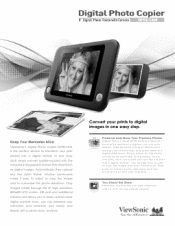 Most people already know the benefit of having a digital photo frame display their images. Electronic picture frames can show off a large number of pictures at once as opposed to a wooden photo frame that will only show one, or a bulky photo album, that takes so much space on the shelf. But how can you transfer your old pictures or slides to digital photo frames without spending a lot of time and money? Although it’s fairly easy to get old photos from traditional into digital format, it takes a lot of time and some skill to do that properly. Also, a computer, a photo scanner or slide scanner and a photo editing software are necessary. Fortunately, there are many services today available that will scan your pictures and slides and transfer them to DVD or other digital media. With your images in a digital format the are much easier to view and share. And most importantly, they will be protected from physical damage – just be sure to make a backup copy and keep it in a safe place. Using scanning services to digitize your old pictures is usually affordable and can save you a lot of time. And it’s certainly worth the effort and expense to see your old memories prominently displayed in digital photo frames come to life again! This entry was posted in Arts and Entertainment on February 5, 2014 by admin_z.